Having ergonomic chairs in your office can increase the comfort, productivity, and long-term health of your employees. If you’re looking for office chairs for your home or office in Alpharetta, Sandy Springs, Johns Creek, Marietta, or anywhere in the greater Atlanta area, visit our luxurious showroom at NorthPoint Office Furniture. Conveniently located in Roswell, Georgia, our showroom has a seemingly endless supply of chairs that you’ll be able to see, touch, and sit in to help make your decision process a little easier. 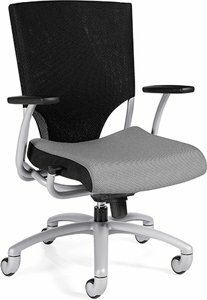 Our ergonomic chairs for the office have a number of features that can benefit your wellbeing, like integrated lumbar supports, height- and width-adjustable pivoting arms, and adjustable seat and back angles. NorthPoint also carries chairs in a variety of fabrics like mesh, pillow-top, leather, vinyl, and more, so you’re sure to find a chair that is both comfortable and that adds to your office’s aesthetics. When you purchase ergonomic chairs or other modern office furniture from NorthPoint Office Furniture, you’ll also benefit from our unparalleled customer service. Our staff can help with basic office layouts that may improve your office’s efficiency or enhance the atmosphere. Plus, once you’ve purchased your office furniture from NorthPoint, we will assemble everything for you at no additional cost, saving you time and money. For more information about our selection of ergonomic chairs, conference meeting tables, desk furniture, or any other products we offer at NorthPoint Office Furniture, contact us today or visit our beautiful showroom. We proudly serve businesses and homeowners in Dunwoody, Milton, Kennesaw, and throughout the Atlanta, GA, region.